I am hanging out today over at Heron’s Crafts for her weekly Story Book Crafts series. I’m sharing a new Harry Potter shirt and how to do reverse stencil. Stop by and say hi! And here’s a printable you can use for a stencil :) Just click on the image to enlarge and then right click to save it. I also have a slight weakness for fan related shirts. I may have over 10 Potter shirts alone. 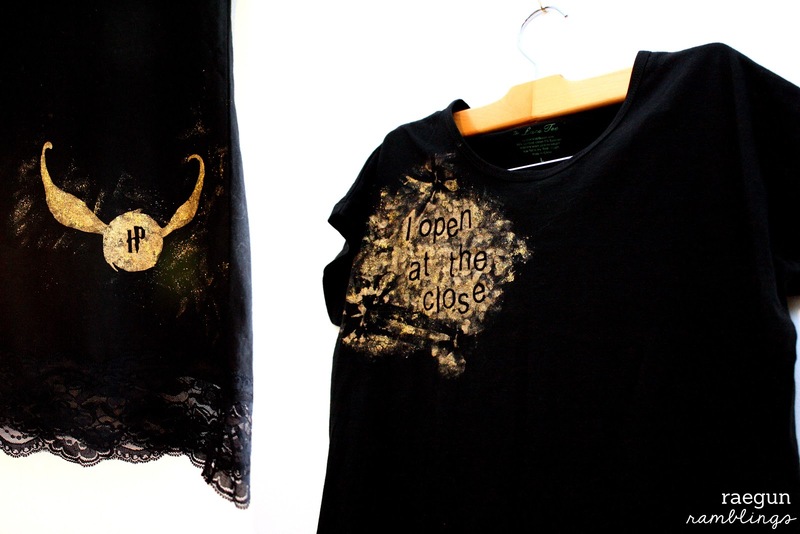 So today I want to share with you how to make a fun Snitch shirt. Make your stencil. I cut my stencils out on my cricut but you can just print your design and and then cut it out of the freezer paper with an exacto knife. You’ll want the shinny side to face down. Iron your stencil (shinny side down) onto your shirt. Make sure to take your time and check that all the edges are sealed. For the snitch I just used it as a basic stencil but for the lettering I did a reverse stencil and put the cut out letters down and then painted on top of them so the lettering was the color of the shirt. Put something in between the layers of the shirt. I just use a pieces of freezer paper shinny side up. Start painting. I find that with this technique it is much better to blot and avoid brushing since you don’t want to accidentally pull up the stencil. For mine I used the metallic paint first then did the glitter paint. Pull off paper. The paint will still be tacky so be careful when removing the paper. I like to use s straight pin to hold down the shirt while I pull off the stencil. Allow to dry completely and you’re done. I hope you try it out. It’s SO much fun. 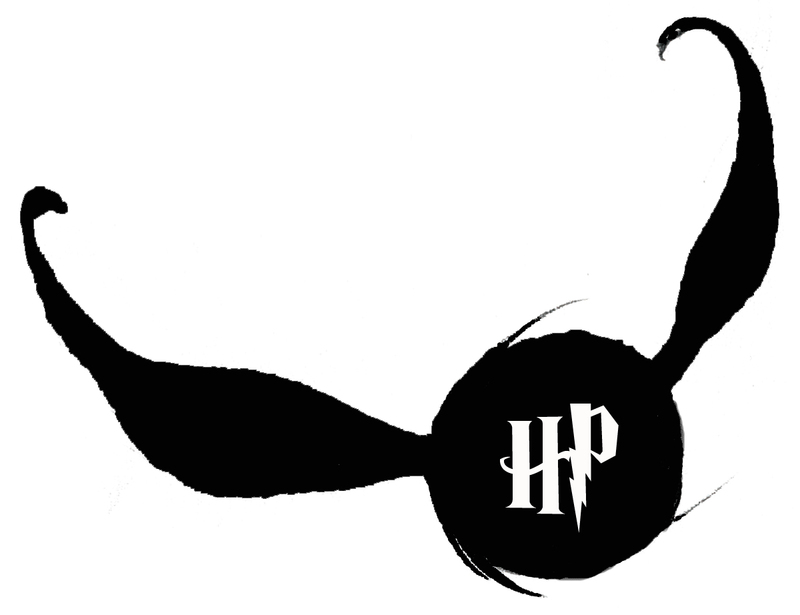 Feel free to visit my blog to get a printable of the snitch that you can use to make your stencil. If this went a bit fast for you feel free to check out my Freezer Paper Tutorial that has a bit more thorough instructions and lots more pictures. And definitely let me know if you have any questions. My sister instant messaged me and then called me when I didn’t return her message (I wasn’t at the computer) to tell me I had to look at the link she had sent me. Knowing how much of a Harry Potter Freak I am she knew I would die over this. I am so jealous. The second I have any spare time (not looking like that will be soon but whatever) I’ll be making one of these babies for myself. Didn’t Darla do an absolutely amazing job?! 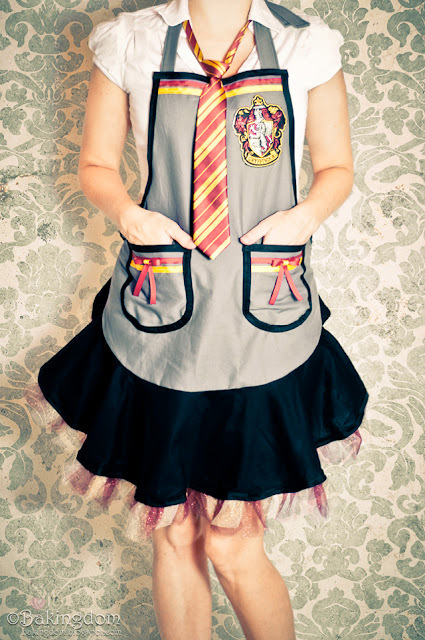 To see more pictures click over to see her post as well as other Potter goodies. 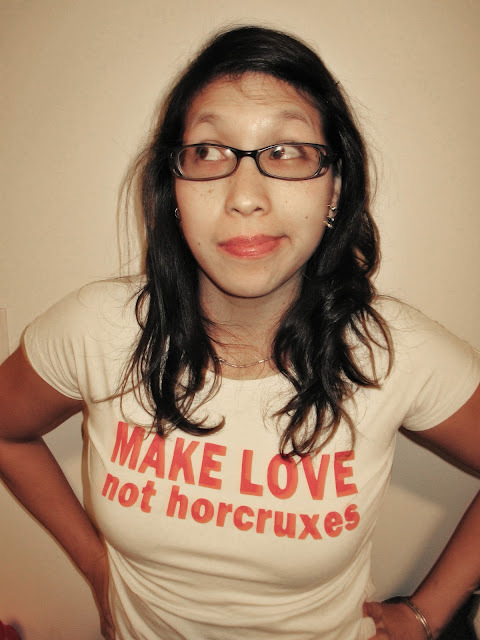 She’s my new Potter-crazed Blogger crush, yeah big fluffy hearts for sure. So I know I made my own Potter-inspired aprons for me and the naughties, but I like Darlas WAY more plus you can never have too much potter stuff right? 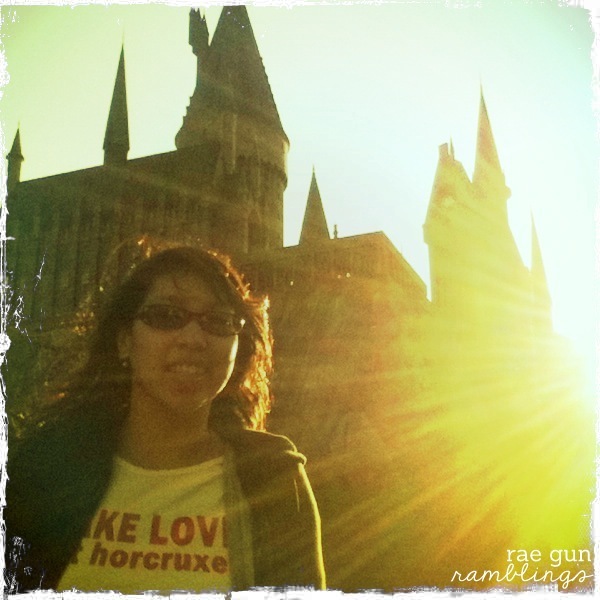 And if you need more proof of my Potter obsession you can find evidence here and here. 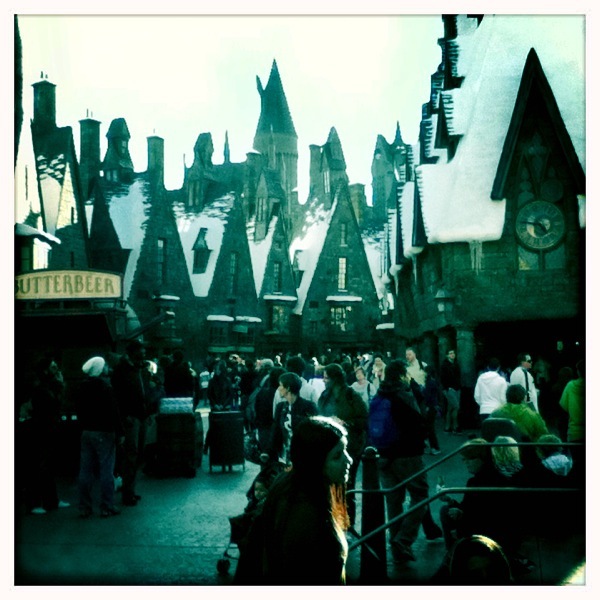 Okay you guys know I’m a huge fan of all things Harry Potter (proof) so when my husband gave me a vacation which included a trip to Universal Studios to visit The Wizarding World of Harry Potter I was first so freaking excited and so nervous I was going to be let down. It’s going to be a long post, sorry in advance to any Potter haters. Let me tell you now. I was NOT let down. We both keep on saying how awesome it is just when you walk up to the gates of that section of the park. As humungo fans it was visually amazing, overwhelming, and more wonderful than either of us could imagine. If you’re planning on going you should know that we endured a timeshare presentation to get free tickets. These tickets were a 87$ value. For that price you get into Universal’s Island of Adventure and the Potter stuff is part of that. We found out the hard way that Universal split the park in half when they opened Potterland so it literally felt like half an amusment park. It was MUCH MUCH smaller than Disneyland in Anaheim or Magic Mountain in Valencia (like maybe a third of the size?). That being said besides the Potter stuff the park was pretty lame. There wasn’t much, just a handful of rides and some shops. We got there at 12pm and were kinda tired of it by 4pm ummm yeah…for 87$ I’m not sure. I mean I’m so glad we went and it was amazing BUT I’m not sure if I’d have the same feelings if I’d paid almost 200$ for both of us you know. I’ve heard rumors that they may be expanding the Potter part, if that’s so it may be more worth it in the future. 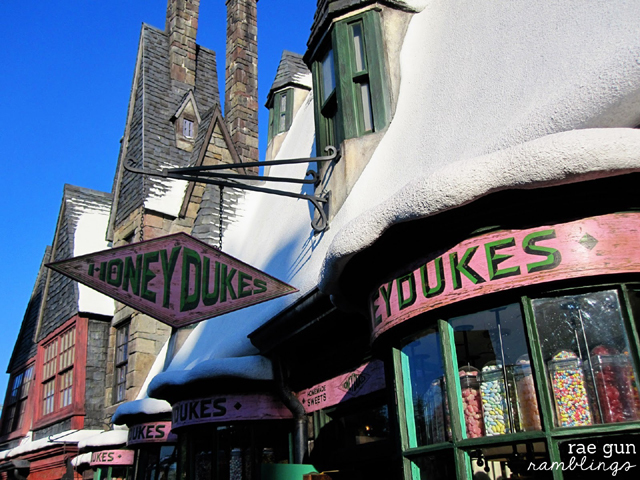 Okay so besides that little bit of practicality, the Potter part was wonderful, and we had loads of fun just being there, slowly taking in every nook and cranny and of course taking tons of pictures. 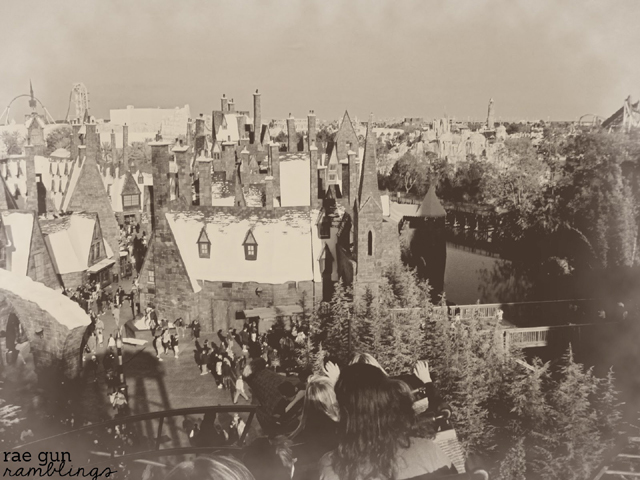 The Wizarding World of Harry Potter consists of a bunch of buildings which you only see the exterior. 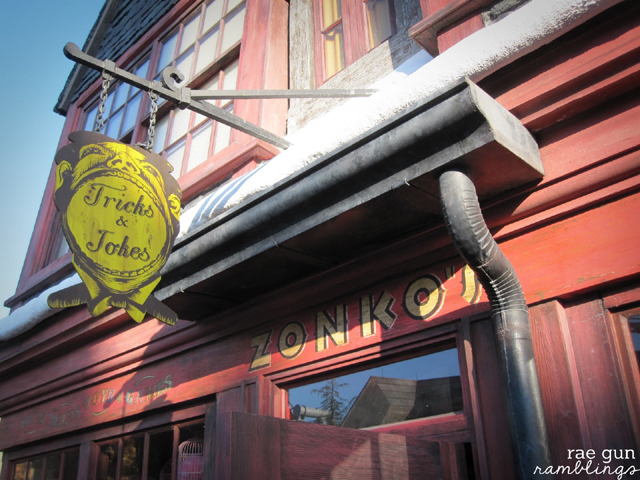 There are a few that you can go into including Zonkos which is connected to Honeydukes the candy shop. The insides were okay I’ll post some pics on my flickr later today. The Owlry is just a store with stuff like shirts, robes and other fan things. If you buy post cards you can get then stamped with a Hogwarts stamp right outside the door. 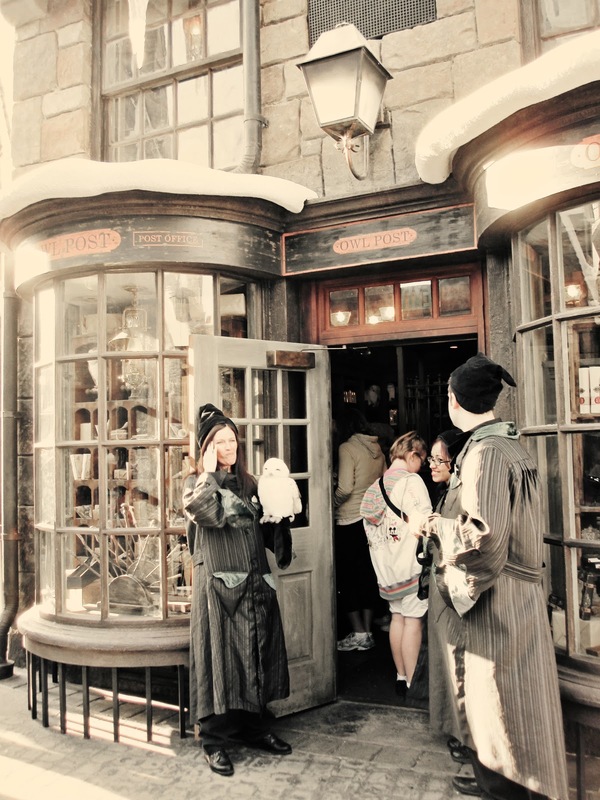 You can go into Ollivander’s to look around or choose a wand (we just looked around). 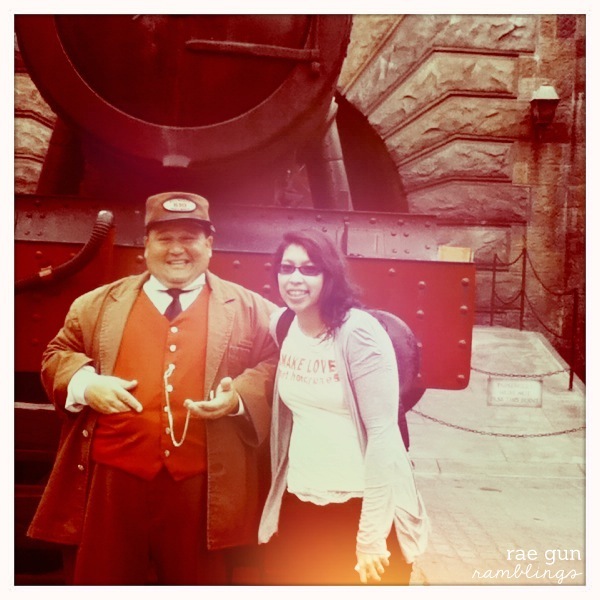 You can take a picture by the Hogwarts Express, sometimes the conductor is there too. Oh something really cool is that they have free lockers that you can stash bags when you go on rides that you’re not allowed to carry anything with you. This was great for us since we had a backpack full of food. 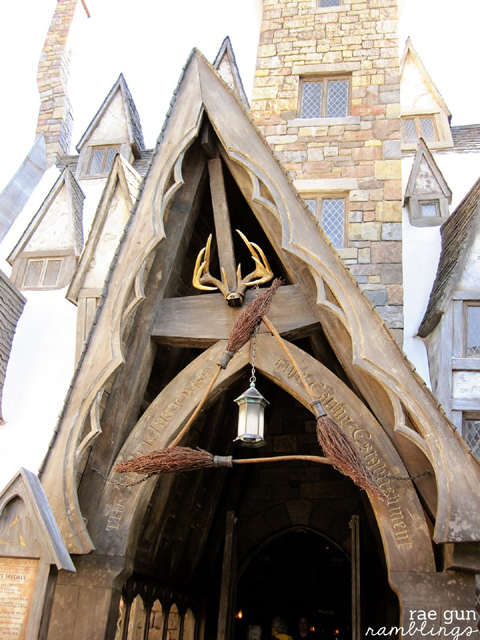 There is a ‘restaurant’ and bar that is just a dark room with wood tables that’s supposed to be The Three Broomsticks. None of the food was appealing (of course it was over priced park food) and it was kinda of cold. I WISH that they had the school banquet room as a cafeteria style eatery but no. The rides include The Flight of the Hippogriff. This is a mild coaster. I liked it a lot it reminded me of Goldrusher at Disney. 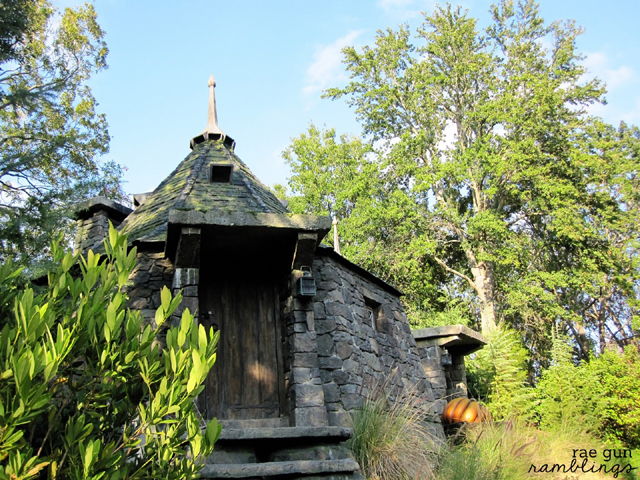 It’s short and you get to see Buckbeak, over look the whole park, and see the outside of Hagrid’s hut. 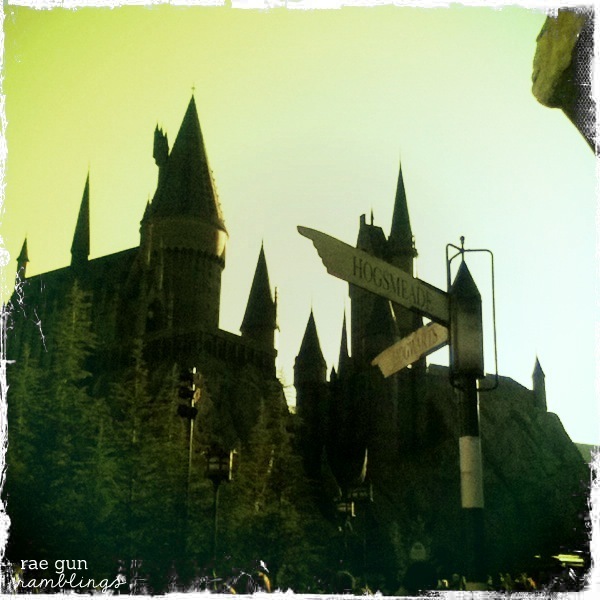 The tour of Hogwart’s ride (Harry Potter and the Forbidden Journey) is the main ride and it is weird. It feels like you’re in a hanging coaster seat but I didn’t get how it moved. It was part simulator because there were a lot of movie screens that would play clips (made for the ride, not from the movie) and you kinda went through traditional ride stuff (you know structures sticking out at you) but it also had various screens with simulator stuff. You tilted turned and the screens made you feel like you were flying. It was cool but dizzying. Daniel actually felt really crappy afterward (and we’d taken motion sickness pills earlier in the day). The details were cool, the line to get to the ride was really cool (sorry no pics of that my battery died in line and of course the spare battery was in the bag in the locker). I’m just not sure I was into the type/style of the ride. The other ride is the Dueling Dragons which I believe was an existing ride that they just adapted, kinda, to fit the theme. It was actually a really fun hanging roller coaster. Daniel and I both liked it (this one didn’t make him feel weird at all). 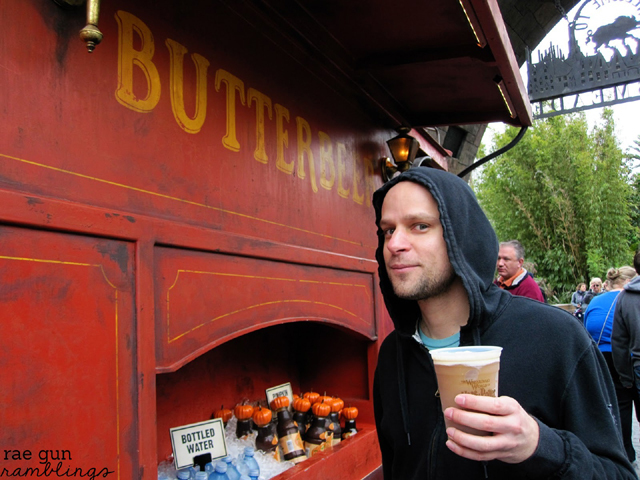 They have butter beer carts. I wasn’t sure I’d like it because I hate rootbeer and I assumed I didn’t like creme soda but Daniel got a frozen butter beer and it tasted delish. To me it tasted like a yummy butterscotch frozen shake. Daniel described it to people as a combo of butterscotch and creme soda. It was really tasty. They also have a couple shows. An acapella choir with cool frog bass things. They were cool and super cheesey in the way that acapella groups can get, if you know what I mean.They also had a short ‘dance’ thing with the Beaubaton girls and the Drumstrang boys from. Both were fun to watch. 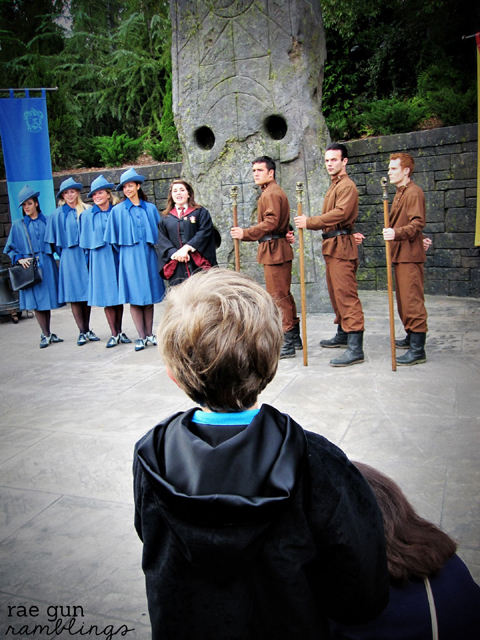 Oh yeah and there were tons of little kids running around wearing robes and holding wands. Totally melts my heart! And awesomely Myrtle was in the bathroom…well her voice. Okay was that long enough? This was the shortest I could force myself…seriously. So if you’re as crazy as me check out my flickr where I’ll be putting more pictures up. I still think they could have made it all so much bigger and included so much more. But what they did they did wonderfully. I hope they consider making another bigger stand alone Potter-only park…maybe more West ;) Anyways that’s a lot I know but let me know if you have any questions. 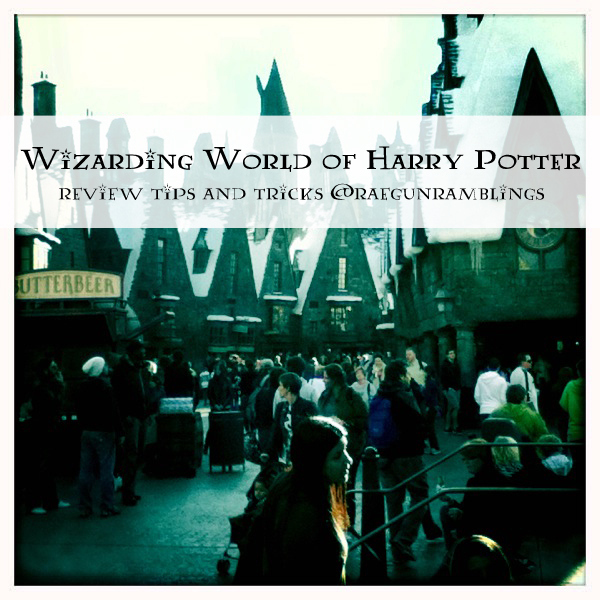 If you liked this be sure to check out all my fun Harry Potter related creations, parties, recipes and more! Thanks for visiting my blog. I am so honored you want to know a little more about me. My name is Marissa Fischer. I live in Salt Lake City, Utah with my music making hubby. I have one baby boy Teddy who just turned two! We worked hard to get him and though we haven’t slept since he got here we just adore him! I am super close with my two naughty nieces who you’ll see in many of my posts (7 and 8 years old). We’re Lutherans and our faith is important to us. I spend the majority of my days sewing for my Etsy shop Rae Gun. It’s my full-time gig and I absolutely love it. I wrote a kinda personal post about my journey on Etsy. You can ready it here. I have a passion for helping people who want to get started selling their creations so if you have any questions don’t hesitate to ask. Two of my favorite things are creating and reading. Whether with Hunger Games parties, pillow case tutorials, Harry Potter Weasley clock hacks, or what I’ve been reading or eating, Rae Gun Ramblings is where I, share all things crafty and bookish. In addition to, and often in cooperation with the geeky and craft stuff, I come from a long line of food lovers. So whether it comes to making delicious meals at home or finding a new awesome restaurant I’m there. On top of what makes in on the blog you can see a lot of my daily foodie adventures on my Instagram. I adore meeting readers and other bloggers in person. If you are in SLC and want to connect send me a note and hopefully we can make that happen. For those of you who are local I often participate in local crafty, bookish, and blogger event. If you’re planning on being at a local meet up send me a note before hand since I would love to be able to say hi. I’m a snacker especially chips and dip and cheese and almost anything savory (but never mustard or anything pickled). That being said I won’t turn down chocolate. I am a note taker and list maker. Just from where I’m sitting I can see 5 notebooks that I’m currently using and a bunch of notepads that I use for my lists. I have a weakness for cute embroidery scissors. My drug of choice is Diet Cherry Coke or really yummy lemonade. I love guest posting as long as I have time and advance warning. Feel free to invite me to be apart of any fun series that you think I’d be a good fit. I am currently accepting submissions for guest posts for any creative or tasty bookish posts you can email me pitches at any time. If you do not hear back from me with in a week please send me a reminder. Every July I do a Harry Potter series if you’d like to be a part of it let me know and I’ll add you to my email list! Rae Gun Ramblings Copyright info: All content and images are property of Marissa Fischer unless otherwise noted. Photos containing people (ANY portion) require written permission prior to use, 1 project picture may be used with a clear link back to my site. DO NOT use my photo in a derogatory manner or to create a meme. Please let me know if you feature my creations, mention me, or use my tutorials or recipes since I’d love to give a shout out on social media and I just like knowing where my hard work goes. If you’ve been here for a while you probably have picked up on my Harry Potter obsession. I love those books. Thank you J.K. Rowling! Every year I have a Harry Potter birthday party not a Potter themed birthday party for me but a party for Harry himself. This year it’ll probably be postponed since July 31st is coming up too fast and we’ve just got so much going on. So to celebrate Harry’s birthday month I thought I’d take advantage of this weeks Top Ten Tuesday theme of books for people who like author X and give some of my favs for all you J.K. Rowling lovers out there. To see everyone else’s lists see here. I’ll let you read the synopsis of each on Goodreads and just say what Harry Potter like aspect I loved about each recommendation. 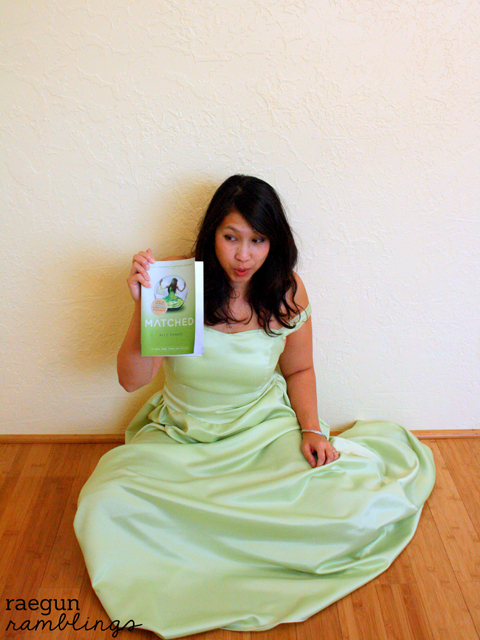 And if you want to be friends on Goodreads you can find me here. The Mortal Instrument Series by Cassandra Clare – I like these a lot they aren’t my favorite in terms of everything I’ve read but I do believe they are the next Potter. The reading following is already big, the movie is under production and I think once they become movies they are sure to take off. I love the whole kids fighting evil and the new magical fantasy world that you get to escape into. I do think they are better for a slightly older crowd than the Potter books for minor sexual content. Percy Jackson and the Olympians by Rick Riordan – I think Rowling fans will like the kids with powers aspect you find in these books. The camp setting give a similar feel as Hogwarts, I’m a sucker for boarding school types of settings and these give me that which I love. Artemis Fowl by Eoin Colfer – For those who love Hermione and her wonderful mind. Artemis is a smart cookie and it’s fun to watch him use his brain in these adventures. Definitely fun midgrade books there are a lot of them and I think they improve as they go on. The Divergent Trilogy by Veronica Roth – There’s just something about being sorted into groups and being identified by your key personality type or highest value. In Rowling’s books you have the houses in Roth’s you have factions. While the feel of these books are totally different than Potter no magic or powers at all, I loved the first two that are out and am excited for the third. The Graceling books by Kristen Cashore – Something I loved about the Potter books was that I could escape into this new magical world. And oh man was I blown away when I got to see a part of that world come to life. These Graceling books have that same wonderful escape and magical new world. Plus they are some of my favorite books I read this past year and I’m sure will remain favorites for years to come. Miss Peregrine’s Home for Peculiar Children by Randsom Riggs – While a few in this list already give you a good solid male POV this is another. It’s got quirky ideas and odd characters. The Chronicles of Narnia by C.S. 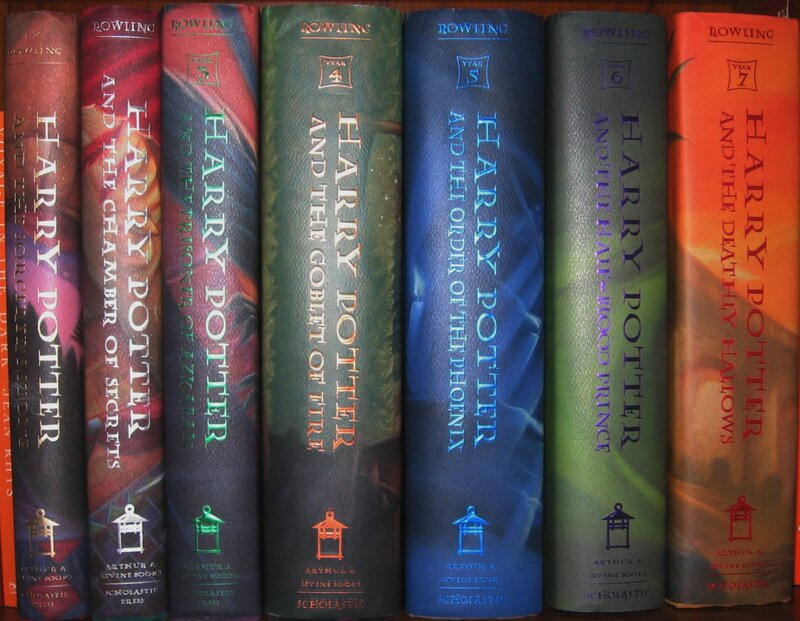 Lewis – I’m not going to lie I never finished the whole series but I did get through the first handful of books and found them really fun and interesting. Great action and like the Potter books always gave you something a little deeper to consider. The Hunger Games by Suzanne Collins – I’m still not sure what it is so maybe some of you can help me out but it seems like these books appeal to the same crowd as the Potter books. I know many of my friends love both series but I’m not positive what besides having kids as the characters is similar. Nonetheless I think many Rowling fans would enjoy these books. Ender’s Game and Ender’s Shadow by Orson Scott Card – Do I sounds like a broken record? These are my favorite books along with the Potter books. Strong male POV, brilliant kids, boarding school atmosphere, interesting teachers and tons of adventure. They are making a movie if you haven’t read these yet now’s the time. Sorcery and Cecelia or The Enchanted Chocolate Pot by Patricia C. Wrede and Caroline Stevermer – And if you just want some more magic in your life and maybe have a love for some regency flair the Cecelia and Kate books are fun quick reads. They aren’t my all time favs but they are easy to get at the library and give you your magic fix. So I’ve been trying to write a blog post for the last 3 hours. The problem isn’t a lack of stuff, pictures, etc. I’ve got projects that I want to share, it’s just that my mind has been taken over and I am giddy and in love. I sat down to type out a crafty post but I couldn’t stop thinking of the book I finished a few days ago. Divergent. Have you heard of it. It is A.M.A.Z.I.N.G. It struck me hard and I feel like a stupid teenager in love who can’t stop thinking of that boy. My sister borrowed it from the library and had another week left so she told me to read it. I did and I’m obsessed. So despite all attempts at sharing my own creativity I must share someone else’s. It’s no secret that I am a Young Adult Fiction fanatic. Ahem, ahem and ahem. I’m not a person that easily names her favorite this or that. If forced I normally say The Harry Potter books and the Bean spin offs (Shadow books) of Ender’s Game were my all time favorites and they still rank right up there but I do believe Divergent is my new favorite. I just wanted to tell you I loved your book. I’m sure you’ve heard it a ton but I know I never get old of people telling me they like the stuff I make. 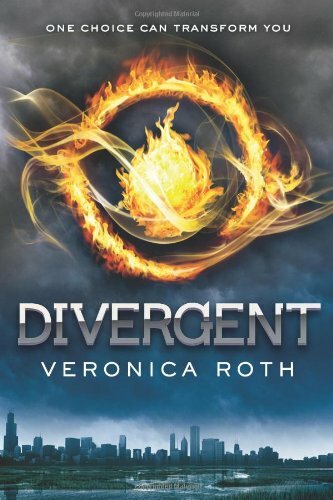 I read a lot and I think divergent may be my favorite book ever. I don’t make those kind of declarations lightly but I just loved it, everything about it, I think it’s perfect. Thanks so much for writing it. I adore YA literature but I’m always a little annoyed at the depiction of love in most books but when I was reading divergent I couldn’t help but think “this is how it is, this is how it should be”. Besides the story which I adored, I appreciated the way you wrote the romances, friendships, and the family relationships. I loved how real you made them, but at the same time didn’t make me feel like I was hearing another downer news story. I feel like you challenged me to be a better person while really entertaining me. When I read that you’re just 23 it made me so happy and excited for you! Anyways I wanted to say thanks for sharing your gift with all of us. 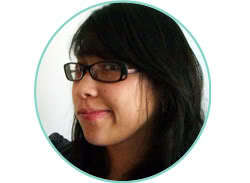 I look forward to following your career and reading more from you. So yeah. Total geek moment out of control. If you like dystopian YA lit like The Hunger Games, Matched, and The Host I highly recommend it. So hopefully that helps me get some of it out of my system, at least until my copy of the book arrives in the mail (so dumb of me to order it using combined free shipping with something that isn’t in stock for a few days, errr). Thanks for putting up with my nerd take over. Thanks for visiting my blog. My name is Marissa Fischer. I’m an auntie, crafter, philosopher (no really I’ve got a degree), sinner saved by grace, lover of food and lots more. 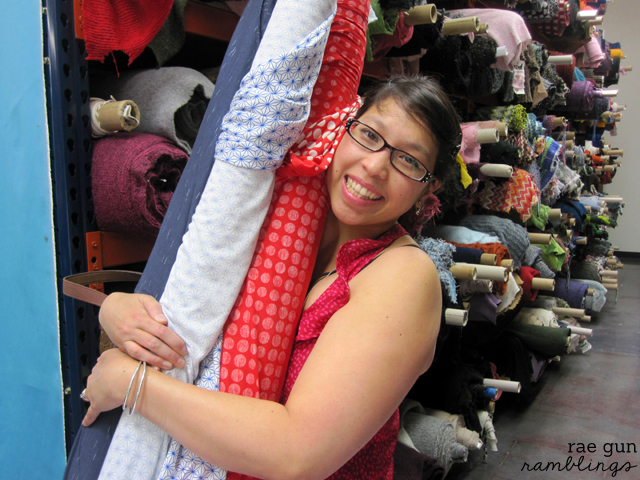 I love sharing the things that make me smile, my going-ons, and my little Etsy shop with you. I have a hubby, I love him. He makes music. His newest project which is my current fave is The Lazy Waves (it’s not on the website yet so if you want to check it out go here). Kinda scattered but hopefully I’ll get around to writing a new fancy and full about page some day but for now this will have to do.